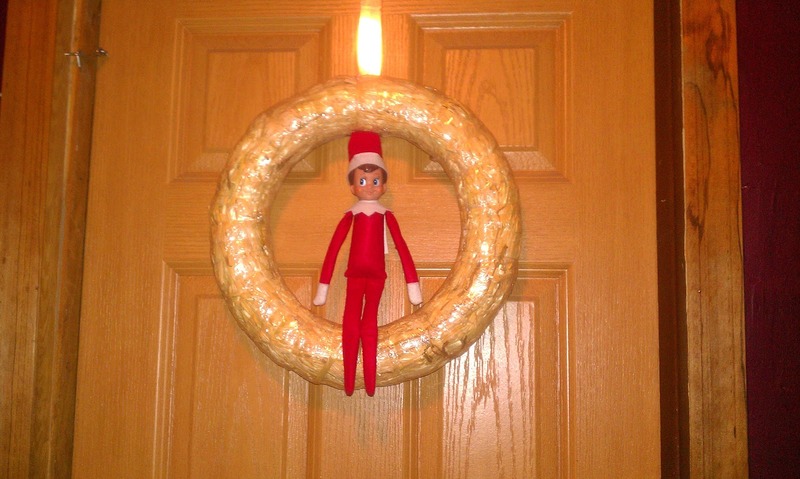 He hung this wreath up, but didn't finish making it...yet. Marley had been playing with playdoh all day so that night Jack decided he wanted to play too. Marley was upset in the morning though because she wanted to use the scissors. Since you can't touch Jack I had to grab the scissors and pull them from his hands so Marley could play with them. Jack was really tired and forgot to fly back to Santa- oops! 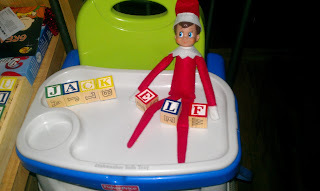 Jack found a friend to play blocks with. Dining with baby. This was in Marley's room, she went up to play later and didn't want him in there so I had to scoop him into a basket and carry him downstairs. HA! 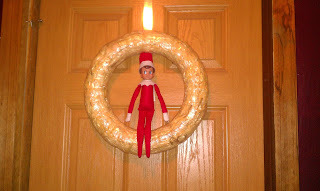 See all our Elf adventures here.